Before you start cringing and thinking eewwwwee…how disgusting, just take a pause, yes that’s marriage. You might share a toothbrush, slippers, lotion, towels, perfume, boxers, literally everything. We needed a break, away from the hustle and bustle of everything, so we planned for a short vacation away from the city. As usual, I was so excited. I love traveling and the break was more than needed. I packed up, he packed up and well, I made sure I counter checked everything just to be certain that we didn’t leave anything important. We packed everything we needed and began our journey. The Lord was gracious enough, we got to our destination well. We had an awesome dinner and retreated back to our cottage to have a rest after a long day. I was busy brushing my teeth as I prepared to soak myself in the tub, only for my hubby to shout. Hubby: Hunnie, where is my toothbrush? Me: I though you put it back in the bag hunnie! Bae you didn’t put it back? Hubby: I placed it on the bed, I thought you would put it in the bag for me baeby! Me: Hunnie, Am sorry! I didn’t see it! Am so sorry. Hubby: It’s alright! please bring me your toothbrush, after you are done! Me: ehhhhhhh…. what are you saying….? So we shared a brush for a full week…actually it was fun! Yes, it is! Don’t look at us thinking how weird. No, just find the fun side of the whole situation. Well, if it makes you uncomfortable, it’s alright to just tell your spouse that you are not comfortable so much but in future, you will be okay. Don’t use words like “I will not”, “I won’t”, “I can’t”. it sorts of creates a negative energy between the two of you. Instead say, “What do you think about doing things this way hunnie, a, b, c”,” “Is it alright with you?” It creates dialogue between the two of you. 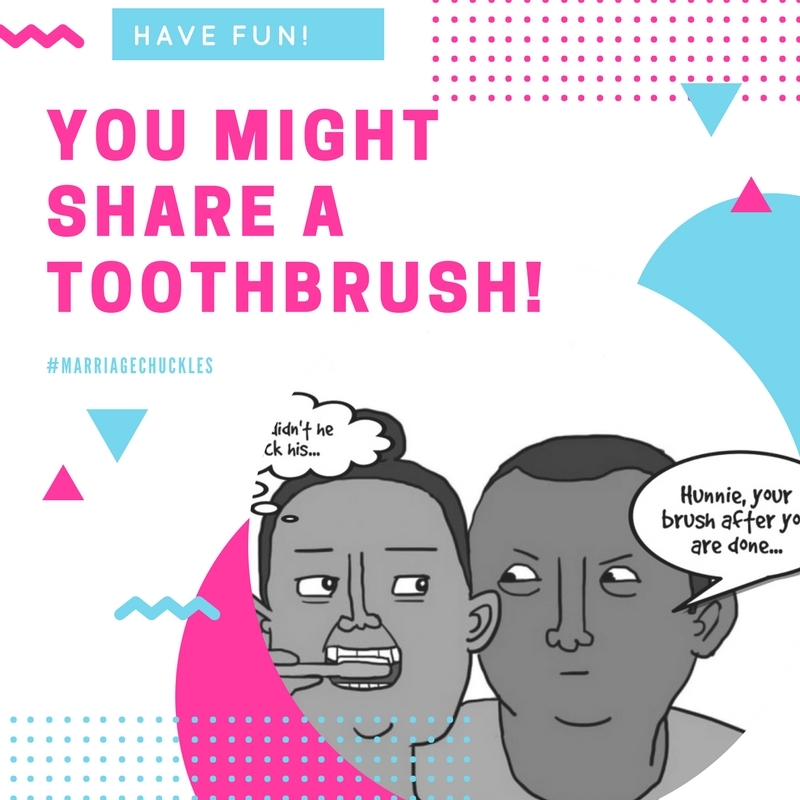 All in all, sharing a toothbrush is now in our “normal” bucket. Marriage is just about finding fun in the little quirks that might pop up! Previous PostA MARRIAGE FOR HIS GLORY. Next PostSCARRED FOR A STORY OF HIS GLORY. That’s a good one! Don’t you love marriage! God bless you Sally and my God sustain you both!